“I will take the Cup of Salvation” (Psalm 116:13). O loving Bridegroom, I am so weak! To cause me to shrink away. Increase my faith, I pray! Oh, wondrous vision my Lord revealed! And the enemies dreaded by me. I’ll make it a Poison draught! Thus Satan in wickedness laughed. My soul felt their power so dire. But His eyes were flames of fire. “BEGONE, ye enemies of My Bride! “I guard this Cup each day. “My Love, art thou strengthened by what thou hast seen? And holds the Cup in His hand. To share it with Thee is grand! Then ’twill be the Cup of Joy. Oh, wondrous miracle of grace! Filled my soul o’erflowing with peace Divine! But my heart with Joy welled up. And whisper a prayer for grace. As I gaze upon His face. (1) Therefore, since we have been justified by faith, we have peace with God through our Lord Jesus Christ. (2) Through him we have also obtained access by faith into this grace in which we stand, and we rejoice in hope of the glory of God. (3) Not only that, but we rejoice in our sufferings, knowing that suffering produces endurance, (4) and endurance produces character, and character produces hope, (5) and hope does not put us to shame, because God’s love has been poured into our hearts through the Holy Spirit who has been given to us. “The LORD alone guided him, And there was no foreign god with him” (Deuteronomy 32:12, NAS). “He restores my soul. He leads me in paths of righteousness for his name’s sake” (Psalm 23:3, ESV). “The path marked out by the Word of the Lord as one of meekness, faith, patience, love, etc” (R1646:5 — Reprints of the Original Watch Tower and Herald of Christ’s Presence). “For if we live, we live to the Lord, and if we die, we die to the Lord. So then, whether we live or whether we die, we are the Lord’s” (Romans 14:8, ESV). “For the Lamb in the midst of the throne will be their shepherd, and he will guide them to springs of living water, and God will wipe away every tear from their eyes” (Revelation 7:17, ESV). “But if we walk in the light, as he is in the light, we have fellowship with one another, and the blood of Jesus his Son cleanses us from all sin” (1 John 1:7, ESV). “(16) Now may our Lord Jesus Christ himself, and God our Father, who loved us and gave us eternal comfort and good hope through grace (17) comfort your hearts and establish them in every good work and word” (2 Thessalonians 2:16-17, ESV). “and you belong to Christ; and Christ belongs to God” (1 Corinthians 3:23, NAS). “To them who by patient continuance in well doing seek for glory and honour and immortality, eternal life” (Romans 2:7, KJV). “And we know that all things work together for good to them that love God, to them who are the called according to his purpose” (Romans 8:28, KJV). “For thou, Lord, art good, and ready to forgive; and plenteous in mercy unto all them that call upon thee” (Psalm 86:5, KJV). Oh, the fulness of his love! Author – Frances Jane van Alstyne (perhaps best known as “Fanny Jane Crosby,” 1820-1915). At 6 weeks old, she lost her sight due to a traveling doctor instructing her parents to apply hot mustard poultices to treat an eye infection, which burnt her corneas. Just a year after she was blinded, her father caught a chill while working in the cold November rain, and died soon after. Twenty-one-year-old Mercy Crosby (her mother) was left to provide for herself and her daughter. This she did by seeking employment as a maid. Fanny’s grandmother (Eunice Crosby) cared for her during the day, and the two became very close. Around the age of 15 years, she entered the New York City Institution for the Blind. On completing her training she became a teacher therein from 1847 to 1858. In 1858 she married (one of her students) Alexander Van Alstyne, a musician, eleven years her junior, who was also blind. Her first poem was published in 1831. Her grandparents spent many hours reading the Bible to Fanny and teaching her the importance of prayer and a close relationship with God. They quickly discovered that Fanny had an amazing capacity for memorization and encouraged her to learn large passages of scripture by heart, which Fanny did — memorizing several chapters each week and she could quote the Gospels, Proverbs, Song of Solomon, and many of the Psalms. When Fanny was five, her mother got another job far away and they were forced to say goodbye to her grandparents. Some of Crosby’s best-known songs are found in the Bible Students’ Hymnal “Hymns of Dawn,” which include: “Blessed Assurance” (Hymns of Dawn — No. 342), and “To God Be the Glory” (Hymns of Dawn — No. 360). 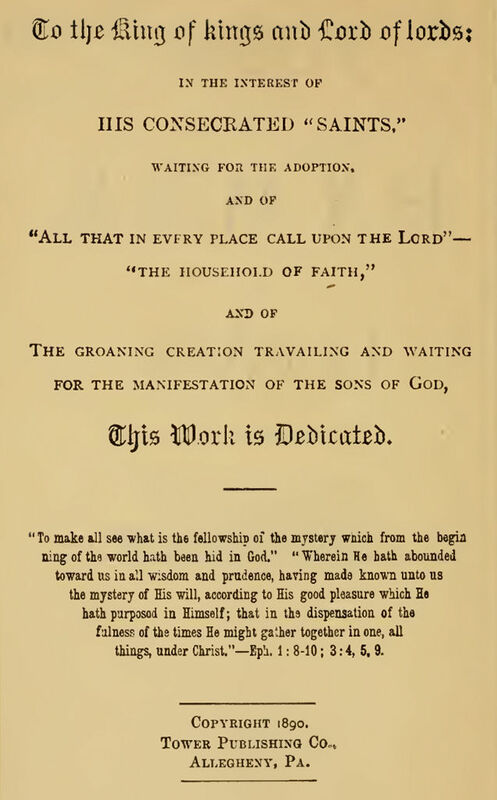 Some publishers were hesitant to have so many hymns by one person in their hymnals, so Crosby used nearly 200 different pseudonyms during her career. One day in the fall of 1874, Fanny did not have enough money to pay the rent and no way to get it. As was her custom, she prayed in earnest that God would supply her need. Not long after she finished praying, there was a knock at the door. There at the door stood a complete stranger who spoke not a word, but handed Fanny a folded piece of paper, and then turned and left. It was the five dollars needed for the rent, the exact amount needed to stay in her flat for another month. Although Fanny was only paid a dollar or two for each of her hymns, she and Van could have lived comfortably on this income yet Fanny’s priority was to give away anything that was not necessary to their daily survival. Hence, the Van Alstines lived in a small, cramped apartment in Manhattan’s Lower East Side, near one of Manhattan’s worst slums, just a few blocks from the notorious Bowery, a well-known “haunt for hopeless alcoholics and the main artery of a thriving red light district and pornographic center.” Because of her proximity to this needy area, Fanny became zealous in her efforts to help the people around her. She became a great fan of Jerry McAuley, a former convict who was converted after hearing the testimony of a friend. Jerry founded the Water Street Mission, America’s first rescue mission, to minister to those enslaved to alcohol and violence as he once had been. She often mingled with McAuley’s audiences, conversing and counseling with those she met. She did not believe in pointing out people’s faults to them. Fanny Crosby refused to let the trials and tribulations of life get her down. The life of Fanny Crosby is an excellent example of how God uses trials and tribulations to refine us, to teach us to depend on Him, and to equip us for the calling He has placed on our lives. Composer – Robert Lowry (March 12, 1826 – November 25, 1899) was an American professor of literature, a Baptist minister and composer of gospel hymns. He was responsible for around 500 compositions, including “Nothing But the Blood,”“Follow On“ (with William O. Cushing), “Shall We Gather At The River?” and “How Can I Keep From Singing?“ He also wrote the music and refrain for “Marching to Zion” (words by Isaac Watts). All the features of the Psalm are applicable to our Redeemer Himself as well as to His followers, whom He styles the sheep of His flock. To His Church He is the Representative of the Father, so fully, so completely, that He could say truthfully, “He that hath seen Me hath seen the Father.” No human being could see the Heavenly Father and live, as the Scriptures declare; and those who saw and understood Jesus to be the Son of God, caught the best possible glimpse of the Heavenly Father. And so we all see Jesus as the Representative of the Father, the Son of the great King, the Son of the great Shepherd, Jehovah. Jesus and His Church are more particularly the sheep of Jehovah’s flock than were the Israelites of the Jewish Age; for the relationship of the Jews was through Moses, while the relationship of the Church is through Christ and the superior Covenant which centers in Him… Jesus declared that there is only one way of entering the sheepfold; namely, through the door. And He declared Himself to be the Door. Self-denial is the first step — self-renunciation, giving up of the will to God. The Covenant reads, “Gather My saints together unto Me; those who have made a Covenant with Me by sacrifice.” All who would be the Lord’s sheep must make this Covenant of Sacrifice; it is the condition under which they may be accepted. Moreover, as the Jews could come only through their appointed mediator, Moses, so we can come into this higher sheepfold only under the antitypical, greater Moses, Christ. There is none other name given. Once having taken this step, once having come into the sheepfold by the Door — in the approved manner — we have the Message of God, saying, “All things are yours; for ye are Christ’s and Christ is God’s.” What this means is described in this Psalm (1 Corinthians 3:22,23). The Lord’s sheep, abiding in perfection of relationship with Him, will lack nothing. Their every need will be supplied. This may not mean greater earthly wealth or name or fame or luxury. The Lord’s sheep are New Creatures, spirit beings, who are temporarily dwelling in the flesh like other people, but who really are waiting for their change, to be completed by a share in the First Resurrection. The Lord’s blessings to Natural Israel were earthly blessings, supplying their every earthly need; but His blessings to Spiritual Israel are spiritual favors. “No good thing will He withhold” from these — yea, even chastisements and sorrowful experiences that may be necessary for their spiritual development. The Psalm assures us that, as the Lord’s sheep, we shall be provided with green pastures and the cool, refreshing waters of Truth. Moreover, while thus being spiritually fed and refreshed, we shall have the peace of God, as is implied in the suggestion that the sheep will lie down in the green pastures — to such an extent that the Lord’s sheep may truthfully say that they have “the peace of God which passeth all understanding” ruling in their hearts, notwithstanding outward trials, difficulties, perplexities and adversities. They [the Lord’s people] in their hearts rejoice in the sentiment expressed by the poet, “Jesus has satisfied, Jesus is mine” (Matthew 6:32). But alas! Not all of the sheep have full confidence in the Shepherd and are fully resigned to have no will but His. Some are continually getting into difficulty, because they neglect the green pastures and cool, refreshing waters of Truth found in the Word of God — because, goat-like, they sometimes wander off into the desert, straying far from the Shepherd and attempting to feed themselves on the indigestible things of the present life, on which no spiritual nature can thrive. Yet even such straying sheep the Shepherd will not leave, if they have become truly His. He goes after them, as the Psalm represents. His rod and His staff are their comfort; [it is a rod of help, defense and chastisement]. With the crook of His staff — He wisely and carefully assists the entangled sheep out of its difficulties — out from amongst the cares of this life, the entanglements and deceitfulness of riches, and the besetments of sin and of Satan. He makes me again to know, to appreciate, to enjoy His provision for me and to see how much better it is than anything I could have provided for myself. [“The prophet does not refer to a restoration of body or of physical health, but a restoration of soul, being. Some of the Lord’s most precious saints have been weary and faint and troubled—even the dear Redeemer fainted under his cross, and was neither kept whole or made whole miraculously on the occasion. The application of the Prophet’s words to the Christian experience would make these experiences, called restoring of soul or being, to correspond with our justification to life. All our lives were forfeited under the divine sentence, and by faith a complete restitution or restoration of soul is granted to the believer, that he might have something to offer in sacrifice to the Lord, “holy, acceptable” (Rom. 12:1), and that in this sacrifice service he may walk in the footsteps of the great Shepherd who lay down his life for the sheep. Thus are the true sheep led in right paths, in proper paths, advantageous to their spiritual development, though frequently trying and difficult to them according to the flesh. This favor and blessing and opportunity comes to them not for their own sakes or worthiness but through the Lord’s grace — ‘for his name’s sake’” (R3268)]. A further experience is next brought to our view — the Shepherd’s leading. “He leadeth me in the paths of righteousness.” He causes me, even by my own stumblings and difficulties, to learn to appreciate the desirableness of His ways and the undesirableness of every other way. All His ways are perfect, are righteous. He leads us not contrary to our wills, but in harmony therewith, to prove what is the good, next the acceptable, and finally the perfect will of God (Romans 12:2). All of our lives we have been in the shadow of this great Valley of Death. Only father Adam was ever on the mountain-tops of life. He lost his footing there, and descended gradually the slopes into this Valley of the Shadow of Death. We, his children, were all born here. We are dying daily; we are surrounded by dying conditions. We have merely the hope that the Lord will lead His sheep back to the heights of life. He is now leading His sheep of this Gospel Age — the Church, the Body of Christ. By and by He will lead the world, during His Millennial Kingdom; as He declared, “Other sheep I have, that are not of this fold; them also must I bring,… and there shall be one fold and one Shepherd” (John 10:16). The Lord’s consecrated people, even when misunderstood, misrepresented, defamed and opposed, are still privileged to feast at the Lord’s Table! The table — represents God’s provision for their needs — the promises of God, the assurances of His favor, etc. Another evidence that the Psalm belongs especially to the Church of this Age is the statement, “Thou anointest my Head with oil.” Jesus, the Head of the Church, was anointed with the oil of gladness above His fellows. That holy anointing oil used on the priests and kings of Israel typified the Holy Spirit, which came upon the Church representatively in Jesus. And this same anointing oil has come down over all the members of the Church, which is the Body of Christ, as we read in Psalm 133:2. “My cup runneth over.” The word cup is used in the Scriptures to represent a draft, sometimes sweet, sometimes bitter, sometimes both. The intimation is that the Lord’s Cup signifies bitter experiences and trials in the present time; as Jesus said, “The Cup which My Father hath poured for Me, shall I not drink it?” And this was the Cup — His Cup—which He offered to His disciples and which we, in becoming His disciples, propose to share with Him, and which is symbolically represented in the Communion Cup (1 Corinthians 10:15-17). It is sweet and precious, in many senses of the word to be privileged to participate in the sufferings of Christ, in any sacrifices or services for the Lord and His Cause. The sweet mingles freely with the bitter. But the Lord promises that in the future the Cup of new wine in the Kingdom shall more than compensate for any bitterness of the present time. but we would not wish it one drop less. How precious the thought — God’s goodness, God’s mercy, with all those who are truly His in Christ — following us day by day, moment by moment, and according to the Scriptures making all things work together for our good! Then the grand finale is signified, “I shall dwell in the House of the Lord forever” — in the Heavenly House, of which the Redeemer said, “In My Father’s House are many mansions;…I go to prepare a place for you,” and “I will come again and receive you unto Myself.” Then, at His Second Coming, with our glorious change, we shall enter the Father’s House in the fullest sense of the word, on the spirit plane, which flesh and blood does not inherit. This shall be the everlasting portion of God’s Elect — the Church. The great blessings subsequently to come to the world — earthly blessings — will in no sense interfere with, but enhance, the glory of the Church; for she will be engaged with her Lord in dispensing blessings to the earthly sheep (Galatians 3:29).